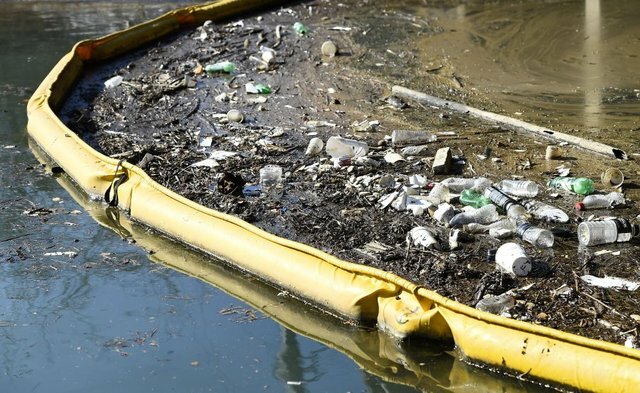 In the past rivers and lakes were cleaned with ‘Two people in a Tinny with a set of tongs’ This is not efficient and is a very expensive solution to what is becoming a major issue. Working with Chatoyer Environmental, Ocean Crusaders have developed several options pending the type of waterway or drainage system you have. Rather than chase debris all over the place, install a debris boom to capture debris 24/7 and then simply clean out the boom. They are cheap and easy to install and easy to service, no special boat required for servicing, just a couple of people and some nets. 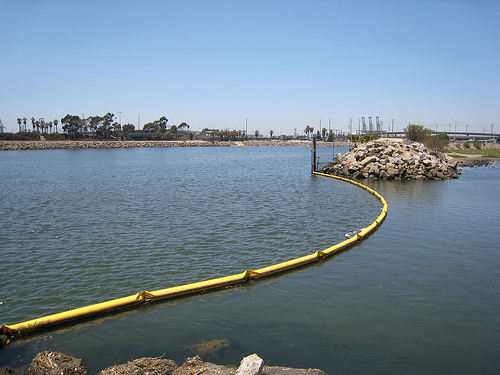 We can capture debris on an outgoing tide and maintain it in the boom when the tide turns, or we can provide a boom for single direction flowing streams. Either method provides a solution that collects debris 24/7, making it quicker, cheaper and more efficient than any other method available on the market. To find out more simply email us or call us on 0412 932 808 to discuss your needs. Below is an example of systems installed on the Sunshine Coast that we currently service on a regular basis. The trap system allows for tidal movement. It is currently installed under Horton Parade Bridge in Cornmeal Creek where the Sunshine Coast Plaza is. The issue was debris being blown and thrown from the balconies of the plaza. On an outgoing tide, the next stop was the ocean. Our booms collect a large portion of what used to escape and instead of 4 hours weekly for a 500m creek, we now spend 1 hour and collect more as not much escapes. We also have a boom installed in Upper Stumers Creek in Coolum. The creek is too shallow to get a boat into and has thick bushes and grass reeds all along it, making it a nightmare to clean. To prevent the majority of debris entering a simple boom was installed across the main storm water run off area and has been catching debris that washes into the system, preventing it getting further into the creek. Initially we pulled over 500 bottles from one area about 50m long and 20m deep. After the boom, we have found very little rubbish in the entire system. We don’t have booms on every access however the amount of debris in the system has decreased significantly since the boom has gone in. The boom also acts as an awareness campaign for the locals when they see what is being caught. Below are images of a boom that is set up to collect debris before it hits a beach in Parrearra Canal. As the winds blow all the debris to one side and it then slides down the wall, it all collects in one area, making it easy to collect from the water rather than off the beach. We can customise systems to suit and have contacts for top of line units as well through our friends at Cleanwater Group. Below you see their Drain Buddy capturing Oil from a carpark. This was the third day of rain before the oil started seeping from the bitumen. However it also captures debris, but has an overflow system, ensuring there is no concern with flooding. Our goal is clean oceans and waterways.